« Does Obama have an identical twin brother in Jakarta, Indonesia? 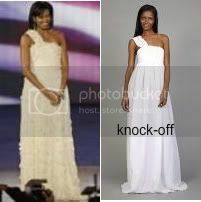 Want “Michelle Obama’s inaugural ball gown?” She’s not selling it, but you can get a knock-off. Unfortunately (or fortunately, depending on your take on the gown), “Jason Wu, the designer of Michelle Obamas frothy, cream, one-shouldered gown, wont be reproducing the look for the masses.” However, if you thought Michelle Obama’s dress looked hot (as Paris Hilton would say) or if you found yourself coveting her look at the inaugural balls or if you want to emulate her style or for whatever reason want a similar dress, you can now buy one at www.edressme.com. This store will start shipping the dress on March 15. The dress is selling for $320. This entry was posted on Sunday, January 25th, 2009 at 00:50 and is filed under Michelle Obama, Michelle Obama's inaugural gown. You can follow any responses to this entry through the RSS 2.0 feed. You can leave a response, or trackback from your own site.